This webinar focuses on the challenges of leading a transformational change effort that has the potential to address the underlying institutional and faculty assumptions and behaviors that affect student interest, progress and success in the study of STEM fields. Participants will explore several key questions that anyone undertaking and leading a significant change effort should consider as they design, launch and seek to expand an effort to improve interest and the outcomes of STEM education. Topics will address each phase of a typical cycle of change including reading the institutional environment and making the case for change, creating a theory of action to support the design of a change effort, selecting a suitable approach to an identified problem, identifying resources to support the effort, launching the effort, tracking the progress and impact of the change effort and reviewing the outcomes and drawing lessons from the experience that can lead to the creation of a supportive environment for further change efforts. This webinar is designed to help faculty members and midlevel administrators who are seeking to promote interest in STEM fields and to support successful completion of a STEM degree within the complex and diverse environments of college and university campuses today. Format - Online web presentation via Adobe Connect web conference software with questions and discussion. Go to the webinar technology page for information on using Adobe Connect. Detailed instructions for joining the webinar will be emailed to registered participants one day prior to the webinar. Dr. Judith A. Ramaley (pronounced Rah may' lee) is President Emerita and Distinguished Professor of Public Service at Portland State University in the Mark O. Hatfield School of Government and President Emerita of Winona State University. She serves on the Board of Campus Compact of Oregon and the Board of Second Nature, an organization devoted to assisting colleges and universities in responding to the challenge of climate change. 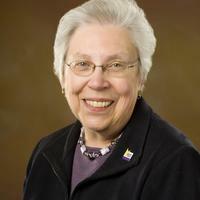 She served as the 14th President of Winona State University (WSU) in Minnesota from 2005 to May 2012. Prior to coming to Minnesota, she held a presidential professorship in biomedical sciences at the University of Maine and was a Fellow of the Margaret Chase Smith Center for Public Policy. She also completed a residency as a Visiting Senior Scientist at the National Academy of Sciences from January to June 2005. From 2001-2004, Dr. Ramaley was Assistant Director, Education and Human Resources Directorate (EHR) at The National Science Foundation. Prior to joining NSF, Dr. Ramaley was president of The University of Vermont (UVM) and professor of biology from July 1, 1997 to June 30, 2001. Before coming to UVM, she was President and professor of biology at Portland State University in Portland, Oregon for seven years (1990-1997). Dr. Ramaley received her bachelor's degree from Swarthmore College in 1963 and conducted her graduate studies at the University of California, Los Angeles, where she earned a doctorate in 1966. Click to download the presentation slides (Acrobat (PDF) 196kB Oct30 17). Click to watch the webinar screencast (MP4 Video 635.6MB Oct27 17). Baer, L. L., Duin, A. H. & Ramaley, J. A. (2008). Smart Change, Planning for Higher Education, 36(2): 5-16. Beach, A. L., Henderson C. & Finkelstein N. (2012). 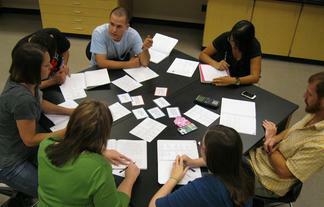 Facilitating Change in Undergraduate STEM Education. Change Magazine 44(6): 52-59. Elrod, S. & Kezar A. 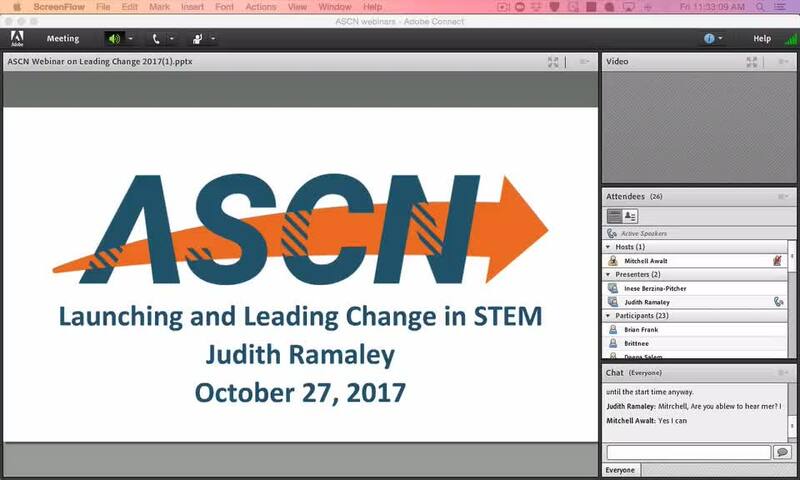 (2017) Increasing Student Success in STEM: Summary of A Guide to Systemic Institutional Change. Change Magazine. In Press. Kezar, A., Gehrke, S. & Elrod, S. (2015). Implicit theories of change as a barrier to change on college campuses: an examination of STEM reform. The Review of Higher Education, 38(4), 479-506. Ramaley, J. A. (2002). Moving mountains: Institutional culture and transformational change. In R. M. Diamond (ed), Field Guide to Academic Leadership. San Francisco, CA: Jossey-Bass. Ramaley, J.A. (2016). Navigating the Rapids: On the Frontiers of the Knowledge Revolution, Liberal Education, Vol 101(4): 36-43.